Explore the flora, fauna and culture of Uganda and Rwanda on this highly rewarding journey. Nature walks in Bwindi will introduce you to rare birds, butterflies and monkeys, climb extinct volcanoes and meet tribesmen to learn about forest secrets and come face to face with mountain gorillas. Taking a forest trail with an elder from the Batwa tribe, a fascinating insight into indigenous Ugandan culture. Check in to your hotel in Kigali's most charming boulevard. Take the winding mountainous route into Uganda, with views of volcanoes in the distance. Your destination is the Bwindi Impenetrable Forest and its abundance of wildlife. Trek through steep, densely forested hills to seek out gorillas in their natural habitat. The trekking is strenuous but the reward of sighting gorilla is immeasurable. Continue to Mount Gahinga, stopping en route at the beautiful Kanaba Gap to view the Virunga Volcanoes and the frontier town of Kisoro. Take hikes into the Muhavura and Gahinga volcanoes and track golden monkeys who live in large communities in the bamboo forests. Take a forest trail accompanied by a Batwa tribesman and gain an insight into indigenous Ugandan culture. Head back into Rwanda and the rainforests of the Virunga volcanoes. 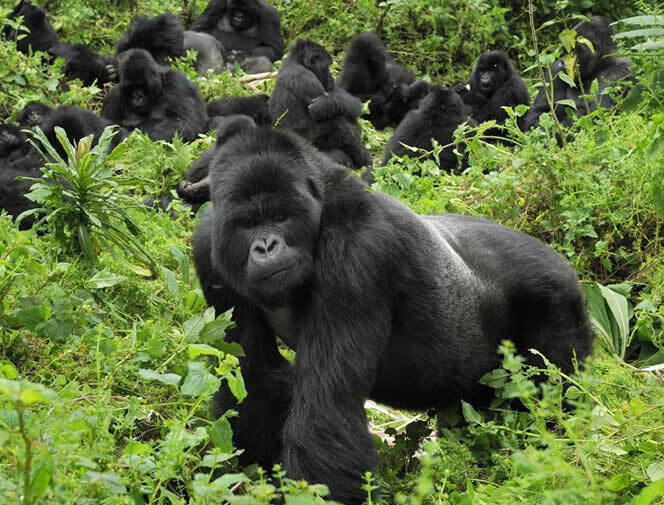 Approximately half the world's population of mountain gorillas make their home in this region. Enjoy gorilla tracking in the Parc National des Volcans. Additional activities include visiting the grave of gorilla expert, Dian Fossey, visiting a local school or community project or taking a walk to Lake Bulera. Visit the ancient palace of Nyanza en route to Nyungwe Forest National park in southern Rwanda, home to around 300 bird types, butterflies and orchids, as well as 75 different species of mammal, including 13 primate. Enjoy a number of walks, tracking chimpanzees, black and white colobus monkeys, the grey-cheeked Mangabey and golden monkeys. Time permitting, explore Kigali and its market, pottery project, handicraft shops and the genocide memorial. Depart on your return flight home. OUR HOLIDAYS ARE TAILOR-MADE PLEASE ASK US FOR PRICING OPTIONS. There are a number of factors which will influence the price of your travel arrangements, including the season, category of lodges/hotels chosen and any additional services added to the basic holiday. Our Uganda & Rwanda Adventuire Holiday is a tailor make journey for 13 days. As a guide line this featured itinerary is priced from R110,500 per person. Includes: 1 night Kigali including breakfast, 2 nights Bwindi National Park, 4 nights Virunga National Park, 2 nights Nyungwe Forest National Park with all meals. Includes: Park fees, transfers, touring and sightseeing excursions. We believe that value for money is important, we want you to travel with ICAN Holidays again. When comparing prices, ensure you are comparing like for like as often there may be a cheaper option, but there may be hidden extras or the quality may not be as good.